Rosemary and Crime by Gail Oust, a Mysterious Review. 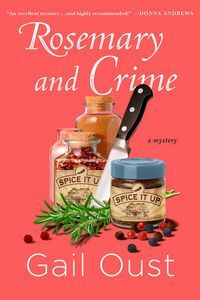 Review: Newly divorced mother of two Piper Prescott takes her settlement money and opens a specialty spice shop in Brandywine Creek, Georgia, only to have her debut spoiled when the chef, who agreed to participate in her grand opening, is found stabbed to death the night before the opening, in Rosemary and Crime, the first mystery in this series by Gail Oust. Piper had hired Chef Mario Barron of the Trattoria Milano Restaurant — Brandwine Creek's answer to fine dining — to give a special cooking demonstration of roasted lamb spiced with juniper berries. She finds him dead on the floor of his kitchen. The new Chief of Police, Wyatt McBride, immediately assumes Piper is the killer. After all, her fingerprints were found on the murder weapon and he has a witness, who will testify that she was arguing with Mario that very afternoon. Motive, opportunity and no alibi, an open and shut case. But Piper isn't about to be convicted for a crime she didn't commit. Teaming up with her best friend Reba Mae, they decide to conduct their own investigation, a Georgia version of Cagney and Lacey they think, even if most of what they do comes off more like Lucy and Ethel. The whodunit element of Rosemary and Crime is nicely handled, but it is the cast of characters that is the real treat here. Piper and Reba Mae are a delightful couple of amateur sleuths, who seem to always find themselves in the path of no-nonsense Chief McBride. The contrast between them works well here to the advantage of the story. So too does the setting in small town Georgia. Humorous, often whimsically funny, this is an enjoyable cozy mystery. Special thanks to guest reviewer Betty of The Betz Review for contributing her review of Rosemary and Crime. Acknowledgment: Minotaur Books provided a copy of Rosemary and Crime for this review.